Our felted ornament workshop class is back! Sign-up to get hands-on instruction on wet-felting wool around styrofoam to create homemade and beautiful Christmas ornaments! Learn how to add embellishment and needle-felt ornaments inside of cookie cutters. It will be sure to add a crafty touch to your tree this year! 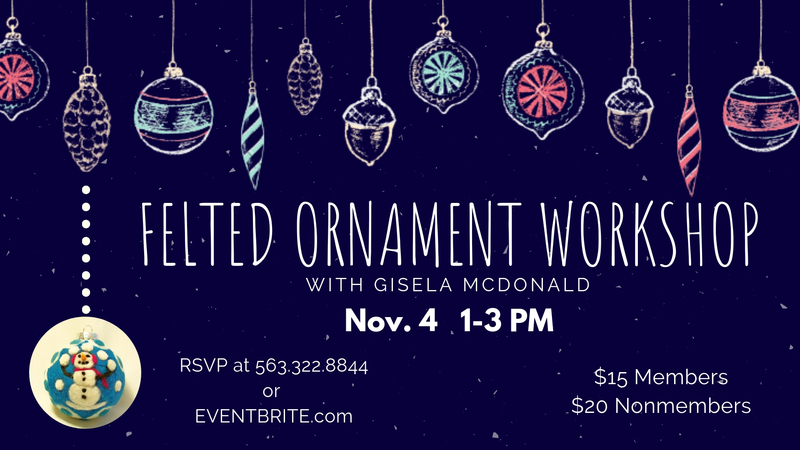 This workshop will have the expertise of Gisela McDonald in creating wonderful homemade ornaments, no supplies needed! Space is limited so please RSVP by calling 563.322.8844 or purchasing your tickets on Eventbrite.com!